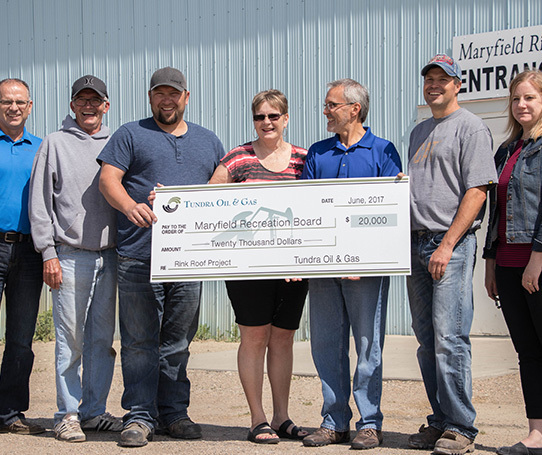 Tundra Oil & Gas recently donated $20,000 toward the Maryfield Rec Board’s project to repair the roof of the community skating rink. Through multiple fundraisers, a federal grant, and Tundra’s gift, the Maryfield Rec Board will begin working on the repairs by mid-June 2017. In keeping with its commitment to bettering the lives of its employees and residents in its operating communities, Tundra believed it was important to support this community initiative. The roof repair will ensure that the rink can be enjoyed by Maryfield and surrounding communities for years to come.